Trying to find great apps for moms or kids can be hard with so many available. That's why I've partnered with Apparoo - the app discovery service for busy moms. Each week I'll be sharing the "Apparoo App of the Week" with you. Very often they've negotiated to bring you great paid apps at heavily discounted rates and sometimes even free. I'm very excited about this and welcome your feedback on the apps you decide to install. Shake your tailfeathers and join blue macaws Blu and Jewel for a colorful read-along adventure set in Rio de Janeiro. This delightful app, featuring characters from the popular animated film Rio, will appeal to fans of the film and newcomers alike. The narrated storybook will encourage your child’s reading skills, the coloring tools will foster their artistic talent – and the bonus activities will grant you peace and quiet over at least two extra states on your next cross-country flight. 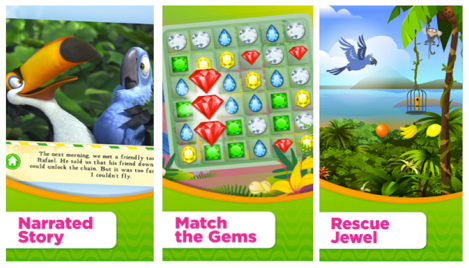 A feast for the senses, this bright, fun-filled app is like a tiny little Brazilian vacation on your iPad! Download it here. That is such a cute app, I bet my daughter will have fun with it. This looks like a fun app for the kiddos. I'll definetly come pack to see what the "Apparoo App of the Week" is every week. Super cool idea! Ooh i need to check this out! looks like a lot of fun! This looks like a fun app. You are right, finding apps that is perfect for the kids is a hard thing to find. There are just so many options out there. Thanks for sharing. I agree with @Brittanie - finding good apps for kids is actually pretty hard, as there are just so many options out there. I am going to show my daughter this and she if she would like it.. Not sure if its her age group or not. Very cool app. My son would love this. This is so neat that you get to do this, I like the app. Good to have an opinion on new apps. My kids are too old, but I'll share this with my sister...and she will be flying soon. My daughter loves the Rio movie. I will have to download it. Great App Need To Get For The Kids! What a great idea to partner with Apparoo to find quality apps for kids. There are a ton of apps out there and who really has time to wade through so many? It's great that there is a trusted source out there. The music, bright colors and happy nature of the movie are bound to carry over into this app. It sounds like fun! Shake your tail feathers, lol. :) This does look like a fun app. OMG this looks like so much fun. My son would love for me to load this for him. We loved the movie...I think my son would love this app. Thanks for sharing. Looks like a great fun app for the kids to play! Thanks, I don't know much about apps so this will help a lot!